The close of this week brings to an end the 11th week of my job search since the beginning of the year. In retrospect, I may be incorrect on precisely how many weeks it’s been, so I am just going to go based off my last post about the job search. Don’t worry, this post will be a lot less academically written, but still chock-full of pictures of graphs and numbers! I am still using the same method and process as described in my previous post. Since 2/25/2017, I have applied to 34 jobs. The additional weeks have also allowed institutions to respond to applications as well. Of note, we see a decrease in the percentage of No Responses (from 85% to roughly 77%). This can be seen in an increase of rejection notices (from 6 to 16), and In-Process (no decisions made as of yet – from 1 to 3). As discussed in the previous post, I have removed the “Interviews” slice of the pie chart, as these are already counted in the “In Process” or “Rejection” slices. As reported in the last post, I will also look at applications without the current week’s applications (which numbers 8 applications). In doing this, the number of applications submitted is 73. Of these, 54 (74%) have no responses, with rejections (22%) and interviews (5%) changing as noted. A break-down of application responses may be found on the Data Analysis Sheet. In comparing the two dates, we see a similar trend, with a slight change towards public universities. Overall, percentages per sector remain similar. Government applications remain at 0 due to the US Government Hiring Freeze as of January 23, 2017. A break-down of application responses by sector may be found on the Data Analysis Sheet. The information on this section has been changed a little to make the displaying of data more intuitive. 2/25/2017’s map had a variety of colors, showing red as 1 application, and green as many. I have opted to move to a light green -> darker green scale to better showcase the actual applications for geographic region. Over the last three weeks, positions have been posted with a skew towards the west, which now accounts for 38% of all applications. Applications in the Midwest and South have decreased in general, with applications stemming from the “South” still only being focused on in the DC area. No other states in the southern US have locations with applications. In terms of state distribution, there are still concentrations in the DC area (though less in this round of analysis compared to the previous examination), Boston, and San Francisco Bay Area. 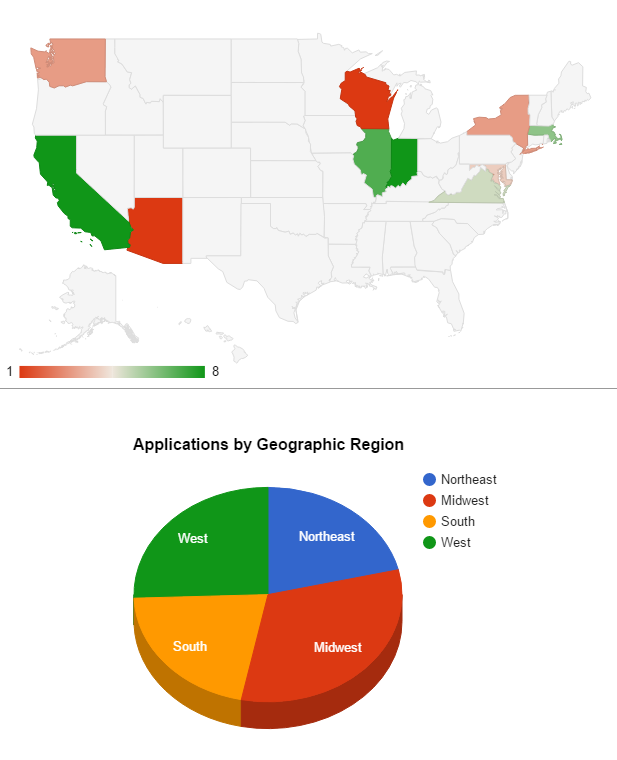 California remains at the top of the application list, now with 16 total applications. The DC area accounts for 12, as does the Boston-metro area. A break-down of application responses by region may be found on the Data Analysis Sheet. In examining the sourcing of job postings that have been applied to, we see a little more variety across the board. This indicates less of a reliance on LinkedIn (which previously accounted for 55% of all jobs applied to, now at 41%). HigherEdJobs.com sees a significant boost as a source of applications, rising from 11% to nearly 20% of total applications. It is also interesting to note that there is not a lot of overlap between the above listed websites. University sites will have jobs listed, and may not be listed on other sites. Of note are some HigherEdJobs postings mirroring those on a University site, or those on LinkedIn. However, there have been few posted to HigherEdJobs and IDJ, EdSurge, etc. However, I have not been collecting data on postings which have multiple sources, instead only indicating the first place I had seen/applied from. A break-down of application responses by source may be found on the Data Analysis Sheet. I should note in this section a few items. In between the two postings, I have had two additional interviews (one with a private university in the West region, which was performed via Skype, the other in person at a Land-Grant Public University). I have also taken a job at a newly-opened local coffee shop, helping build the business, train staff, and create training materials. Responses have begun to come in, which is helpful, regardless of if they are for an interview, or an outright rejection – it helps focus the search and move on to more applications. The fact that I am working again does mean there is less time to search and apply – however, I continue to dedicate my time and energy to finding a full-time Instructional Design job. At the end of 2016, my employment at Wick’s Wheels Scooters in Bloomington, IN came to an end when the shop closed the doors permanently. While a sad occasion for myself and the Scooter community, it signaled an impetus to increase the Job Search for me. I’m an Educator by trade, and I’ve found numbers related to a variety of topics very interesting – grades for students over time (or based on different types of projects/instructional approaches) in schools, or the frequency of required service by scooter models, so it may come as no surprise that I have turned some of my analytical mind towards what I have been concentrating on since Jan. 1, 2017: the Job Search. Before looking at the numbers, it is important to say that I have been looking for a while. While working at the scooter shop, I was encouraged to explore potential full-time employment. During my tenure at Wick’s I applied to several positions, had an interview or two, but ended up not receiving an offer. The search increased exponentially as word came down of the shop’s imminent closure. The data I have stems from Dec. 21 until now (and the posted charts and data should auto-update as I add more applications). The state of Indiana allows for an individual to collect up to 26 weeks of unemployment insurance provided they meet certain criteria (pages 6-9). Individuals typically receive around 40% of what their employed income was before taxes over the last calendar year, with a weekly maximum benefit of $390. (For those curious, no, I do not receive nearly that.) At this juncture, I’d like to point out that unemployment benefits are treated as taxable income. As such, income taxes at the Federal, State, and Local levels are withdrawn from the awarded weekly benefit. It should be noted that the weekly logs only have to have one job applied to, and only offers three spots to report applications to. This can make it difficult to accurately report applications, as more than 3 may go out in a week (for instance – the week of 2/20/2017 – 2/26/2017, I submitted a total of 21 applications as they became available). It is also suggested that claimants retain a log and evidence of their applications in case of audit. My own log is where I am drawing my data from. In order to log my job applications, I have been using Google Spreadsheets. I have chosen this application as it is part of the larger technological ecosystem I have been using for the job application process – my personal email address (bryrhoey@gmail.com) is used for correspondence and application accounts (with a folder/label dedicated solely to Job Search related materials); Google Drive used to create and store my Resume and Cover Letters, as well as any other application materials required. Job postings were searched for using the key words of “Instructional Designer” and “Educational Technology Specialist” and include all related postings which show up with these key words. 8 weeks of data collection (12/21/2016 – 2/25/2016) have yielded some interesting data in regards to locations applied to, response rate, sector, and job source. As the data in the links above is continuously updated as more jobs are applied to, I will use screenshots for the discussion here. 47 jobs applied for, with No Response rate of about 85%. It should be noted that approximately half (21) of these applications were during the current week of 2/20/2017-2/25/2017, and thus should not expect a response this quickly. Not counting the last week of applications, our numbers shift to 26 Applications, with 19 having no responses (or 73%). It should also be noted that Interviews are included in the chart, but may have resulted in a Rejection or In Progress (in this case, 1 Rejection, 1 In Progress). Based on a cursory Google Search, that seems about par for the course when submitting applications. 2/27/2017 edit – I have removed the “Interviews” portion of the pie chart from the continuously updated link to more accurately display the status of applications. You can find the number of interviews on the “Data Analysis Numbers” page linked above. In Process: At least the initial screening (usually phone) has been completed, and no decision has been made. Based on the information, just over half of the positions applied for are located at Privately Held Companies, while Public Universities make over a quarter of the applications. Of note are the 0 Public K-12 positions, which have not come up in any of the job searches. Government applications remain at 0 due to the US Government Hiring Freeze as of January 23, 2017. Regions were defined using the US Census Bureau’s definition of US Regions, and are outlined in the above linked “Keys” page. The spread of geographic regions appears to be rather proportional, with all regions receiving at least 21% of applications. The Midwest lists more applications, partially due to an increase of job listings in Chicago, IL., and partially due to my current location in Bloomington, IN. The States Map shows five main states/regions where applications seem to be concentrated: The DC Metro Area (highlighted by Maryland and Virginia), the Boston Metro Area, Chicago Metro Area, Bloomington, IN, and California (with a majority of the CA applications focusing on the San Francisco Bay Area). These areas were applied to based on a criteria of compatibility of job listings for Instructional Designers/Educational Technology Specialists, Political Ideology, and my own interest in living in the area. Based on the locations of applications submitted, it becomes apparent that many positions are based in major US cities, or the applicant’s preference is to live in a major US city. The information shows a variety of sources of job positions which have been applied to. Of note is the 55% of jobs sourced through LinkedIn. This suggests a heavy reliance on one site over others. On deeper exploration, 21 of the 26 LinkedIn positions are for jobs with Private Companies, accounting for 91% of all jobs applied for in Private Companies. Further exploration of applications, the sectors they are for, and the source of the applications are all planned for the near future. In regards to response rate and sector, it appears that the Private K-12 sector has the best response rate (50%) but a very small sample size (n=2). Thus, there is not enough information to see a trend. As stated in the general response information portion above, the vast amount of applications have no response. Unemployment is a difficult time for many people. A loss of income, a break with routine, and many potential hazards for mental and physical well being and future opportunities. As with any other activity, it is important to look beyond the face-value facts – to seek trends which may bring to light new discoveries, ideas, and approaches. The point of this exercise in “crunching the numbers” and writing about it was three-fold: (1) to brush up on some rusty skills (such as blogging, spreadsheets, etc. ), (2) to actually look at the data, identify trends, and make my own job search stronger, and (3) to be able to step away from job search engines, lists, and e-mails, but remain constructive in the job searching process. I would like to be able to dig a little deeper in the data as I find time, looking across the variables to find out what the most successful types, places, and sectors for applications may be. Of course, I am always open to suggestion. Is there some data I have collected you would be interested in examining (or having me examine)? Would you like to volunteer to review my Resume and Cover Letters for editing purposes? Have a job lead you think I should look into? Get in contact with me, and we can see about arranging something. In the meantime, I will continue to remain determined and hopeful that I will find a suitable position in making a difference, be it at a company, a K-12 school, or a University. I will use this space to reflect on information explored through the Instructional Design Service Course. This post will contain reflections for Module 1, part 2 . This post will be edited as I complete Module 1, Part 2. Module 1 focuses on understanding the learners we will be designing instruction for. These learners are adults whom have dropped out of primary or secondary education, and dropped back in as adults. This section focuses on the general context of adult-based education. The reading discusses the where and how of adult education – most commonly community based in a face-to-face setting. In these types of settings, access to technology, resources, curriculum, and even a dedicated space for learning can vary wildly depending on the community and the day. Blended and online adult based education opportunities are growing in terms of availability, but there are significant barriers to these approaches to education – primarily monetary cost and access to courses. As noted in the reading, many of the low-income, rural, and minority learners without a basic education have limited or no access to high-speed internet, a computer, or both. Furthermore, many blended and online programs use curricula or software which can be prohibitively expensive (expensive being a relative term, particularly when discussing low income individuals where the choice may be between materials for learning or food on the table). Many course materials fall in with this cost-structure, and are either not adaptable or easily adaptable, or openly-licensed. For this course, my goal is to help create and add to the openly-licensed materials available on the internet for all adult learners, complete with an open Creative Commons license (either CC BY-SA – Attribution only -, CC BY-NC – Attribution and Non-commercial sharing – , or CC BY-NC-SA – Attribution, Non-commercial, Share Alike licenses). An important aspect of any educational context is the performance aspect – ways for the individual to prove that they have learned/mastered the material presented. There are a multitude of methods available – projects, essays, videos, discussions, and various tests. For adult education, many return hoping to increase their employability through the attainment of a credential – passing the GED exam, HiSET, TASC, or other exams/programs. As discussed in the reading, the attainment of this credential is rarely terminal – many go on to technical training, university, or some other form of post-secondary education. Did you have a strategy going into the test? How did you feel before, during, and after the tests? How could you utilize what you know about the performance context when designing instruction for you learners? Module 1, part 2 has a focus on the general aspect of Adult Basic Education (ABE for short). ABE has a focus on GED/High School Diploma level education, as well as technical and career-focused education for adults. As an introduction to the concept (and the importance of ABE), the course starts off with a video from the American Institutes for Research. In this video, a large portion is focused on reasons why adults return to school. These reasons vary from correcting past mistakes, securing a job/better job, personal desire to learn, to overcome language or technological barriers, or other reasons. One of the stories in the video mentions that one reason these adults return to school is to be able to help their children or grandchildren with their homework. This makes me wonder about the movement in public schools away from homework – without the students having homework, would these adults have realized that they needed to return to school to get their credential? Things to consider going forward, in terms of the larger picture of education, I suppose. The activity in this part of the module focused on creating an empathy map – a method to help the designer organize relevant and important information related to the individual we are exploring to design relevant instruction. 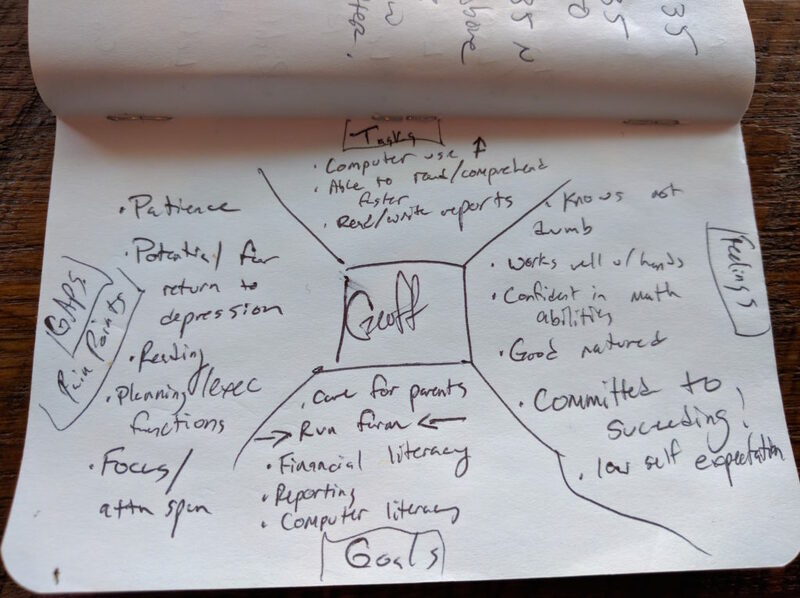 My empathy map focuses around Geoff, who wants to gain the skills necessary to run his parents farm. Based on the dossier on Geoff, we can see that he wants to succeed – but he has reservations on his own ability. A major portion of the design for Geoff will focus on appropriate materials – he needs materials which will not seem condescending (not geared for children), help him with executive function tasks, and above all, allow for patience and understanding. While this specific approach to trying to understand the learner is similar to others I have done in the past, it is also a bit less focused. Going through it, I feel as though there is a bit too much assuming in much of this (though I have done my best to avoid doing just that, to try and keep any personal judgments out of it). One of the harder things an instructional designer must do is avoid having any pre-dispositions or judgments (as was discussed in the Module 1, Part 1 reflection). I think that when time permits, I would like to try this part of the activity again, but under a different framework. If I find one that I have used or like, I’ll be sure to add it here. I will use this space to reflect on information explored through the Instructional Design Service Course. This post will contain reflections for Module 1. This post will be edited as I complete Module 1. This section of Module 1 features three stories of adults who had not finished their secondary education for various reasons, and discussed their desire and drive to gain their GED and beyond to better not only their lives, but the lives of others. In these stories, there are several common threads – life outside of school causing difficulty, distress, or other issues inside school; struggle in life without a completed secondary education (through working multiple jobs to make ends meet, prison, or other issues); and a drive to better their position in life, and those around them, with an emphasis on serving as a role model and mentoring their children, other children, or adults in similar circumstances. The variety of reasons that caused these learners to not complete their secondary education is much larger than I initially anticipated. While I am familiar with some of the stories (peer pressure, issues at home, limited self-confidence in themselves, etc. ), others were foreign ideas to me. Ebony Nava’s story in particular sticks out as something I never considered – parents signing their children up for homeschooling, and never actually providing the schooling. While I fully acknowledge that I have a bias against homeschooling on social-development and ideological grounds, this was not a factor I had ever considered, especially at such a young age (Ebony was taken out at 2nd grade). The common thread of wanting to escape what they all saw as a desperate situation and working hard to meet their goals is part of the feel-good end story, though it does make me wonder how many attempt to do exactly what these learners have done, and have not been successful. You can find the videos used as examples below. The course designers for this MOOC have opted to utilize an Empathy Framework developed by Kouprie & Visser (2009) which uses a four-step approach to developing empathy within design (originally used for engineering and designing products, it translates over to instructional design). Image taken from the MOOC Course, based on Kouprie & Visser, 2009. Note: Being the person I am, I went and looked up the article the framework was developed from, read it, and started to write, reflect, and provide a small critique. If you want to read it, you can find it below. If you want to skip it, feel free to. In their article, Kouprie & Visser acknowledge that the ’empathetic’ portion of ’empathetic design’ is necessary, but vaguely defined. The authors do refer to Koskinen and Battarbee (2003) and Battarbee (2004) for a glimpse into what empathy could mean, with a common thread of understanding the end-user, having the designer do their best to place themselves in the end-user’s shoes, and understanding why certain experiences are meaningful for the end-user. One designer in a team can have a large influence on the others, by expressing empathic reactions. To develop empathy is an individual act, but by discussing it in a team, the discussion serves as a trigger for others to make more connections, which will lead to increased understanding. But how can we, as designers, develop empathy for those we are designing instruction for, and in particular, for the learners identified in this course? While I do not have the data in front of me, I would assume that most of the people who design instruction for a living have not been in a similar situation many of the learners we met in Module 1 have been in. As noted in a recent message through the course, 93% of those enrolled in the course have at least a Bachelor’s Degree, and 66% or more a Masters! The authors of this article provide methods: direct observation and communication (research), communicating findings of user studies to design teams (communication), and evoking the experiences of the designer to the user (ideation). Side note: At this point I find it necessary to think-out-loud that I kinda sorta miss reading academic articles. Bypassing the discussion on the origins of psychological research on empathy (which is fascinating in it’s own right, but not relevant to this particular post), we return to the four steps indicated in the image above. It is at this point that I find myself a bit skeptical about the assumptions provided by the authors. While the steps (Discovery, Immersion, Connection, Detachment) do make sense when building empathy, the connecting assumptions make it a little difficult to swallow. In the research, for example, there is a statement that “the designer’s curiosity is raised” and connects that to the designer’s motivation to explore further. One wonders what happens if nothing raises the designer’s curiosity? Does that stop the process of building empathy at the first step? Does there have to be specific curiosity for the designer to continue to build empathy when designing instruction? We also have a statement that the designer should go into the situation open-minded and non-judgmental. This is a good idea in theory, but there are always underlying assumptions, judgments, and biases which exist in the real world. The authors provide no method or suggestion on addressing this. The authors also state that the Immersion step is the most important phase in this process, leading me to think that it would be just as important to think about how to address the inherent and underlying assumptions, judgments, and biases of the designer. Koskinen, I. and Battarbee, K., 2003. Introduction to user experience and empathic design. In: I. Koskinen, K. Battarbee, and T. Mattelmäki, eds. Empathic design, user experience in product design. Helsinki: IT Press, 37–50. Battarbee, K., 2004. Co-experience: understanding user experience in social interaction. Doctoral dissertation. Series ILMARI A51, University of Art and Design Helsinki. Kouprie & Visser, 2009. A Framework for empathy in design: Stepping into and out of the user’s life. Journal of Engineering Design, 20 (5), October 2009, 437-449. Hello! This blog is to showcase the things which I do in what I would consider my “Professional” Life. Sample items include curriculum development, instructional design, systems design, photography, video production, and a myriad of other things.